The night of trialling from Meekatharra to Wittenoom and the next morning to Port Hedland would be the toughest of the event, with a series of rough, rocky stages through Western Australia’s rugged Pilbara, including two “horror” stages. Crews would cover almost 900 km overnight with only about 120 km of that on the main highway up to the mining town of Newman. Two of the three stages, although quite fast, were extremely dusty. The stage name said it all - dust, dust and more dust. This was a long fast stage on fairly good gravel roads through grazing country with numerous grids, all marked in the route instructions. They were difficult to see in the dust and not something you’d want to hit at 120+ km/h. 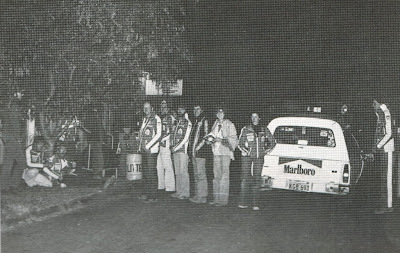 The instructions also warned of road trains operating 24 hours a day but hopefully the rally had deterred them from operating that night! The final 40 km up to Tangadee Station was somewhat slower, being narrow and meandering with a number of creek crossings. The 100 km/h average was achievable if you got a mostly dust free run and didn’t puncture on the somewhat rocky roads. The road order at the front would have been: Ferguson, Brock, Johnson, Cowan, Dunkerton, Mehta, Davis, Nalder, Loader and Barth. Fifteen cars cleaned the stage, including the first seven on the road. Barth also cleaned by braving the dust to pass both the Nalder Celica and the Loader/Hill Lancer, who both had punctures. The Lancer passed the Celica when they punctured and the Celica then passed the Lancer when they punctured, but the Lancer was delayed longer and lost 10 minutes. Frank Johnson's great run effectively came to an end on this stage while lying third outright. The Volvo had a seized diff and was stopped precariously in the middle of the road with hazard lights on. It seems that he was able to make some repairs as the results show the Volvo making it to Tangadee with a loss of 52 minutes but they appeared to not make it through the next stage within late time. They eventually cut to Port Hedland, did another stage and then cut to Kunnunurra, missing a total of 8 controls by Darwin. Further back Portman, Carr and Herrmann all managed to clean the stage, perhaps having to pass some cars in the dust or perhaps just having a lucky break from cars in front of them. Fury was perhaps not so lucky, dropping 8 minutes. Rowney's overheating troubles seemed to continue, or perhaps he was caught in thick dust behind a slower car, dropping 19 minutes. The Commodores of Jackson and Mason were both down the field as a result of delays leaving Perth, and dropped time in the dust. The run of no missed controls for the Roberts Commodore and the McCubbin Monaro effectively came to an end here when they needed to replace a diff on the side of the road and had to skipped this and the next stage (but only one missed control). There is a suggestion in the Challenge book that Roberts left their road card behind and had to drive back from 250 km into the stage. Susequently McCubbin also skipped two controls from Newman to the end of the Nunyerry Horror stage. Crews had no respite at the Tangadee station control and were immediately sent out on what was billed as a horror stage through undulating scrub country eastwards for 93 km almost to the Great Northern Highway. The instructions warned that "The locals would not believe a two-wheel drive could make it!" In between the numerous creeks the track was narrow, flowing and quite fun to drive, but the creeks were numerous, rough, sandy and rocky. The stage had a one hour maximum time penalty. Some crossings were indistinct and covered with grass making it difficult in the pitch darkness to see where the track actually went. Just before 18 km the route crossed Brumby Creek, a major tributary of the Ashburton River. The instructions shown above were accurate and once in the creek bed it was difficult to find the exit. Mehta and Barth got stuck or disoriented there and lost about 10 minutes while Gil Davis had a mechanical problem with the 180B but continued losing about 15 minutes. Overall this so-called "horror" stage was not quite as bad as it was billed and with a very slow 50 km/h average, seven cars cleaned. Best of all was the control official at the end was serving coffee to the crews! Bond's Cortina was ailing and dropped almost an hour while Fury's Cortina was suffering badly with a failing diff and they took the maximum penalty. Both would lose considerable time on the next transport while repairs were carried out. Quite a few later crews went to the end control from the wrong direction without completing the stage, which was something of an achievement given its location hidden 5 km into the scrub off the highway. Davis was shown in the results as cleaning the stage but this is an error because he started in front of Nalder and came in quite a few minutes behind the Celica, so must have dropped at least 10 minutes. In fact only 4 cars are shown with the one hour maximum penalty: Fury, Jensen, Carter and Richardson. Several cars are shown in the results with time losses over an hour, which is difficult to reconcile with the one hour maximum penalty. These included Turner (1 hour 21 minutes), Goldsborough (2 hours 48 minutes) and Lahiff (3 hours and 3 minutes). Faulkner and Walker are listed with 4 hour maximums, perhaps because they wrong directioned the end control, but this would be difficult if they had already been to Tangadee. Roberts is shown dropping only 2 minutes but if they didn't go to Tangadee, surely they got a wrong direction! After the 5km of track out to the Great Northern Highway it was then 100 km up to the Capricorn Roadhouse where time was allowed for refuelling and service, and a midnight snack. The remaining 17 km to the start of the next stage included 8 km of extremely dusty road past the outskirts of the township of Newman. It was perhaps the horrendously dusty conditions on the road into the start of the next trial stage that caught out Dunkerton (1 minute late), Mizel (5 minutes late) and Watson and Rowney (each 6 minutes late). The same could not be said for the Ferguson Commodore, which was first on the road but dropped 3 minutes (but did not lose road position), perhaps requiring extra service time. Certainly extra service was needed by all the Cortinas with Carr dropping 9 minutes, Bond 31 minutes and Fury 1 hour 51 minutes. The Jackson Commodore also needed work and they were 28 minutes late. Mount Meharry is the highest mountain in Western Australia at a lowly 1253 metres above sea level. The route of this stage initially followed what is now the new Great Northern Highway (back in 1979 the highway went straight north from Newman to Marble Bar). The old road diverged from the current highway after about 28 km and then, if you were following the route today, you would pass right through Rio Tinto's Hope Downs Mine at about 75 km and at about 90 km you would pass through BHP Billiton's new Area C Mine before crossing the new highway near the current Coondewanna Wa airfield operated by BHP Billiton. The stage then kinked further west passing about 10 km to the north of Mount Meharry across what is now the southern section of the Karinjini National Park. After passing Mount Meharry, it finished over near where there is now Rio Tinto's Marandoo Mine, adjacent to Mount Bruce and close to what is now the tourist entrance to the Karinjini National Park. A view of Mount Bruce near the end control. What a shame it was dark! This is rugged Hammersley country at is worst – dusty, rocky and with numerous sharp creek crossings. The roads were generally fairly fast but with nasty crests and washaways to catch out tired drivers in the dense dust, which hung in the warm night air. This was reflected in the times with Ferguson at the front being 8 minutes quicker than Brock who was next on the road, who apparently punctured. As a result of their 10 minute loss on the previous horror stage, Mehta had a good gap to Cowan and did the best time. Further back the times started to stretch out. Davis may have had a problem, dropping almost an hour. The Hilton Celica hit a washaway and bent the front end badly, dropping 39. The Loader/Hill Lancer was also quite slow despite starting just 2 minutes behind Nalder. The Fury Cortina was struggling, dropping 49 minutes while Bond was nursing his Cortina, having to constantly stop and add oil as the sump was leaking. They dropped over an hour. Quite a lot of cars had rejoined at Newman having skipped from Geraldton or even from Perth so that 68 cars (plus Stewart) completed the stage. On the other hand, at least 7 cars that had done the two stages from Meekatharra to Newman skipped to Wittenoom or Port Hedland, including Tattingham's EH. There was not much of a rest for crews from Mount Bruce as the next transport was on fairly rough gravel roads, with a fairly quick average required. The route initially passed through the picturesque Hammersley Gorge – a shame it was dark for the front runners! 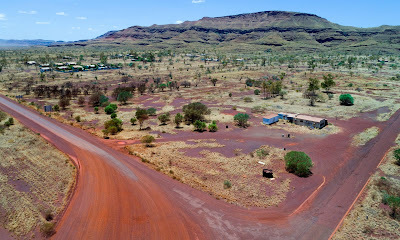 Very little time was allowed for a refuel at the almost ghost town of Wittenoom, famous for asbestos and not much else. It was 88 km out the Roebourne Road to the start of the next stage just past Mount Florence Station. A few of the leaders dropped a few minutes: Herrmann and Loader (1 minute each), Mason (2 minutes), Dunkerton (7 minutes) and Davis (12 minutes). Further back others were having to carry out substantial repairs in Wittenoom including Murray (40 minutes late). The Fury Cortina, now well down the field, needed substantial work and never made it to Mount Florence - they conceded defeat and eventually headed for Darwin. McArthur did similarly but picked up a couple of controls enroute to Darwin while Meehan cut and ran directly to Derby. * Davis's score should have been at least 10 minutes more. We started the Tangadee stage at 6.45 pm with the Lancer 2 minutes ahead and the Porsche 924 two minutes behind. Gil Davis was quite a few minutes ahead of the Lancer. I slept for much of this stage which was very fast but extremely dusty with lots of grids that appeared out of the dust at high speed! Apparently we “caught” the Lancer but could not get any closer than about 500 metres. Barth was more courageous and actually passed us AND the Lancer. I awoke briefly when we passed Frank Johnson’s stranded Volvo – we stopped and took a message for his service crew. A bit later we punctured and I awoke to shuffle the tyres in and out of the back. I awoke next to see the Lancer stopped with a puncture but they were just pulling away and Wes went for it through their dust and passed them – a worthwhile hairy moment as we now had a mostly dust free run through to the end. It was about 40 km from the end and Wes pushed hard but we dropped 3 minutes. I stayed awake ready to drive the next stage which followed immediately with less than two minutes to change drivers. The 1000 Creek Beds stage was actually good fun. The track between the creeks was quite fast and smooth, meandering through scrub country. The creeks were a different matter and at several the track just disappeared altogether into undergrowth with lots of hidden rocks. At the 18 km creek we stopped when we saw three cars also stopped in the creek, so Wes and Geoff got out and had a reconnaissance on foot. Mehta and the Barth Porsche were moving back and forth as if stuck on rocks while Davis had the bonnet of the 180B up looking at something. Soon enough the Commodore and Porsche disappeared and the other waved me through and showed me the way. There was some slippery shale rock that we had to negotiate by backing up a couple of times. There was no sign of the Lancer. Our time was OK (8 minutes) with Davis and the Lancer arriving behind us while we took the opportunity for coffees that were on offer at the control! I then drove the hundred or so kilometres up to the Capricorn Roadhouse while the others slept in preparation for the next long stage. Our service crew were there but the vehicle was running like a dream. Hilton arrived while we were still there and we were a bit surprised that he had cleaned the previous stage and we commented to each other that we thought he was pushing too hard, which was confirmed on the next stage when he apparently had a problem. Wes drove up to the start of the Mount Meharry Stage at Newman but it was so dusty just getting into the stage that we were almost late on the transport. I slept for most of the trial stage despite the roughness and almost incessant banging through dips and creek beds. While we had the advantage of a modest gap ahead of us to the Porsche, it was still very dusty in places and just getting worse for those behind us. We dropped half an hour, which seemed excessive, but we were setting what we considered a sensible pace. Wes continued to drive the transport for about 20 km and then gave in to tiredness and handed over to me. 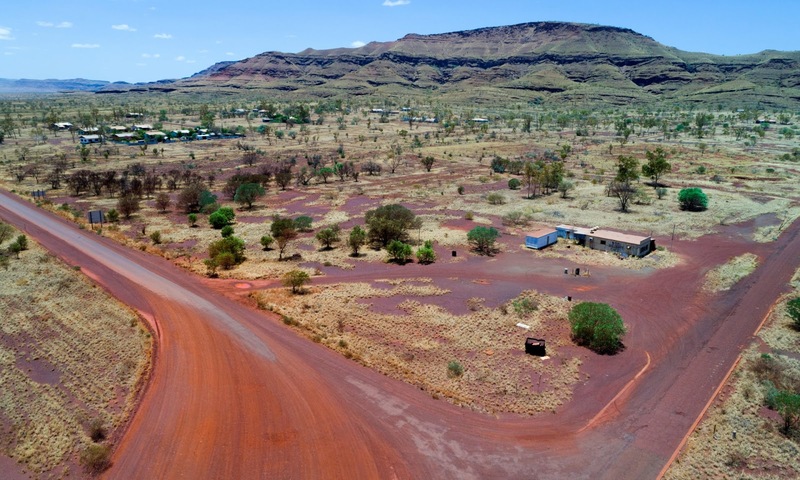 I continued through to Wittenoom while the others slept soundly. After refuelling I pressed on out to the start of the Nunyerry stage but punctured on the transport just as there was a glimmer of dawn in the east. We chatted to the Porsche crew at the control before they headed into the horror stage.